This dip is light and full of flavor and will complete your turkey day celebration…not to mention it’s so EASY!! 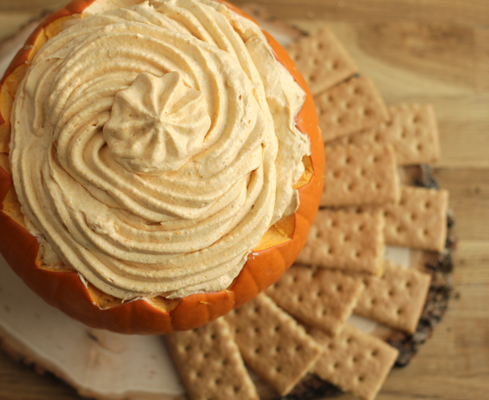 To add a fun and festive look to your harvest pumpkin pie dip, carve out a small pumpkin to serve your dip in. Achieving that beautiful finished off look is a cinch when you use a piping bag and large piping tip. You can pick this up at your local craft store. 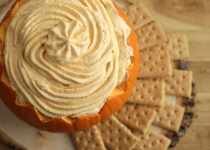 This pumpkin pie dip can be made ahead of time just store in the fridge in an air tight container. Combine, pumpkin puree, Cool Whip, vanilla instant pudding pumpkin pie spice. Mix well and serve with graham crackers.